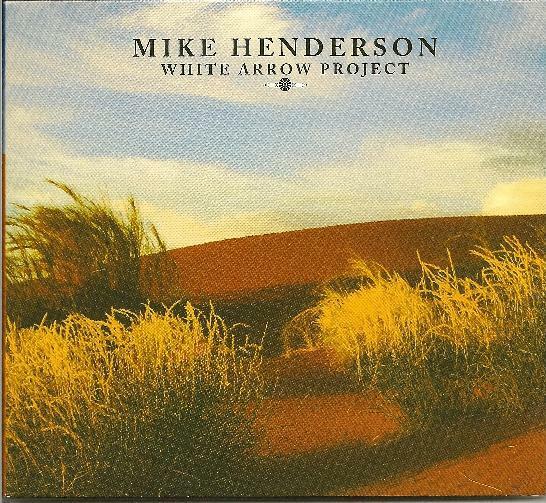 Mike Henderson - "White Arrow Project"
White Arrow Project is a beautiful and interesting album from Djam Karet member Mike Henderson. It's a set of 12 songs, most with vocals, and all very accessible, yet with many additional elements that make this different and difficult to describe. The promo sheet explains that the music is driven by Mike's love for acoustic guitars but is embellished by the interplay of drums, bass, electric guitar, percussion, synthesizer, electric cello and vocals, as well as his interest in artists like Steve Tibbets, Dead Can Dance, Kate Bush and Brian Eno. I don't know much about Dead Can Dance, but the ethnic flavorings of Steve Tibbets, the ambience of Brian Eno, and the uniquely varied stylings of Kate Bush do shed light on what Mike is doing on White Arrow Project, though you won't overtly recognize any of those artists in the music. The songs are characterized by flowing acoustic guitars, sometimes with a Pink Floyd Animals flavor, but with the addition of synth ambience and soundscapes, Mike's wailing electric guitar notes, other instrumentation, and the vocals of Jack Housen and Caroline Dourley. Songs like Lasso feature a sort of Folk-Ambient-Prog-Pop blending, bringing together strumming acoustic guitar, percussion, lush ambience, Djam Karet styled electric guitar, and lovely vocals from Caroline. What makes this difficult to describe is the way Mike has created a core of accessible, sometimes pop flavored songs that transcend normality with all the other elements that are seamlessly injected into the mix. Read My Mind is an acoustic guitar and vocals track that could be James Taylor, but the ambient waves and swirly bubbly synth effects propel the music into an entirely different dimension. Rage is a bit different from the rest, being a Cajun-like pop song with rocking slide guitar and spacey synth colorings. Emergence, Equinox, and Continuum are instrumental tracks that bring the Tibbetts-Eno influence to the forefront, and reminded me a lot of Don Falcone's Quiet Celebration project. Emergence is a nicely grooving ethnic flavored tune with tablas, cello, soundscapes and Mike's guitar licks. Equinox features ambient-ethnic grooves with cool spaced out electronics and trippy but edgy guitar licks. And Continuum is a space-ambient-ethnic instrumental that is mind-bendingly meditative but with much going on musically. One of my favorite tracks of the set. Mike has definitely created something different with White Arrow Project and adds further fuel to my feeling that the members of Djam Karet are among Progressive Rock's most talented and imaginative artists.